Editor’s note: I wrote this several months ago and never posted it. So, better late than never. “If he doesn’t shape up, I’m changing his name to Wayne,” I declared. “Who calls a horse Wayne?” my wife asked. Eight months ago I entered a wild horse training competition, sometimes referred to as “Mustang Makeovers”. My horse, his name is Scratch for now, is a nine-year-old gelding. 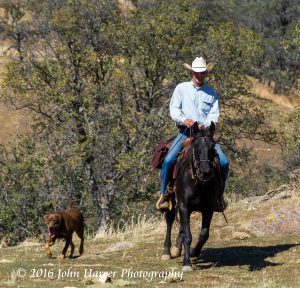 He roamed the mountains of Tehachapi as a stallion for seven of those years. Yep, for seven years he got to do as he pleased, chase women (mares), sleep all day, graze wherever and whenever the fancy struck him. Then some people came along, gelded him, and let him roam free for another two years before he found his way to my trailer at the beginning of the competition nine months ago. We competed against 7 other competitors five months ago and came in fourth place. The competition ended with an auction where Scratch sold for $700 to a man who, knowing a wild horse takes more than four months to train properly, hired me to continue training him. The man, a cattle rancher, instructed me to get Scratch used to the ranching life. As an amateur trainer I had no idea what this meant and told the rancher so. His response was, “Do the best you can”. Realizing he was giving me an opportunity, and not one to look a gift horse….I dove headlong into the training process. Scratch has been a good horse when riding in an arena. Willingness and bravery are traits one looks for in a horse and within the confines of a 5-rail arena, Scratch is a standout. The trail has proven our biggest challenge. Scratch grew up in the wild. When we venture to the trail he switches immediately to “High Alert”. He looks for things to scare him. There is nothing more fear-invoking than being astride an 800 pound animal with a survival response to run as fast as he can in the opposite direction of the thing that scares him. We keep working on it, but if he doesn’t improve I’m changing his name to Wayne. Before my horse training days, my wife and I owned a small retail store in downtown. Vagrants or transients, call them what you like, I prefer street person, stopped in to ask for food or charity on occasion. Wayne was one of those people. I don’t know how long Wayne lived on the streets. He pushed a shopping cart carrying most of his belongings. Wayne had a guitar. Sometimes he would use our electricity to operate a nebulizer to treat his mild case of emphysema. Wayne smoked. Wayne was a nice enough guy. We saw him for about a year. A kitten he found came and went. His guitar was stolen by other street people and it took him awhile to get another. The first week of the month, when he was flush, he shopped our store. The last week we gave him credit until his government check came in. Then, Wayne disappeared for a few months. He reappeared clean shaven, dropped off at our door by a nice sedan. He told us the story of how he reconnected with his daughter, sobered up, quit smoking, and was living with her. We visited while he shopped and soon the sedan came back to pick him up. Wayne came in about once a month for half a year or so, then disappeared again. Later, we saw him back with his shopping cart, guitar, and bad habits. I asked what happened. “Wasn’t what I thought it would be. Sleeping in the same bed every night. Meals were good, but quite boring. Even got ahead on my finances by not smoking or drinking,” he explained. “Why leave all that? It sounds pretty good,” I said. Wayne couldn’t stand prosperity. It simply was not in his nature. He needed to be out on the streets, living on his wits, surviving in the world he knew. Sometimes I wonder if that’s Scratch. Life is hard in the wild. Cold in the winter, fighting for food with the other horses, and natural predators are around every corner. Scratch’s life is easy now. He gets two meals at the same time every day, plenty of clean water, protection from the elements. In return, he’s asked to work an average of an hour a day. Still, he’s much like Wayne. I think he would prefer we just put him back in the wild and let him live in the world he knows the best. Yes, even though it was painful seeing Wayne on the street again, I also respect him for making the decision to be where he wanted to be and not “just conform”.